I went to pick up our marriage license on Friday ($140 later...holy cow!) and while I was in the area I popped into the Loblaw's. Their bakery always produces some very interesting loaves of bread and I'm always curious to try them. The last really good one I had was a rosemary potato ciabatta loaf, which I then used as inspiration to make my own. This time I picked up a loaf of Cranberry Focaccia (with raisins). I tore into it once I got home - the top was lightly sugar crusted and the bread was packed with delicious cranberries and raisins. In an effort not to eat the entire loaf in one sitting, I decided I would turn the remainder into thick slices of french toast for breakfast the next day. For my batter I whipped one egg with cinnamon, nutmeg, and cloves, as well as a splash of french vanilla coffee cream. I cooked the french toast in a grill pan to give each slice those lovely grill marks that I find make everything taste better. 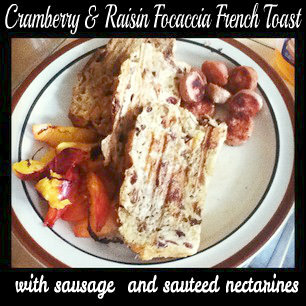 I also sauteed nectarines for some extra sweetness and grilled up a sausage for some savory. Go find a different type of bread and get creative with your french toast!